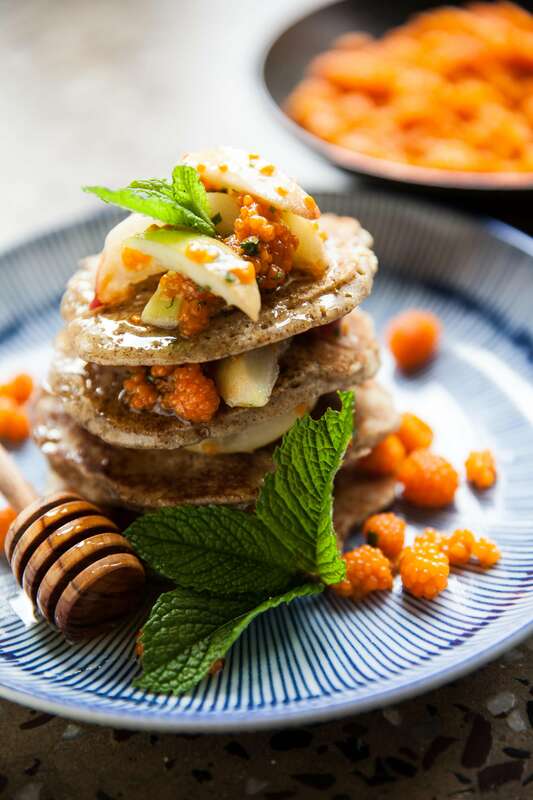 Our ‘stupa’ buckwheat pancakes stack, with freshly picked root berries and mint! 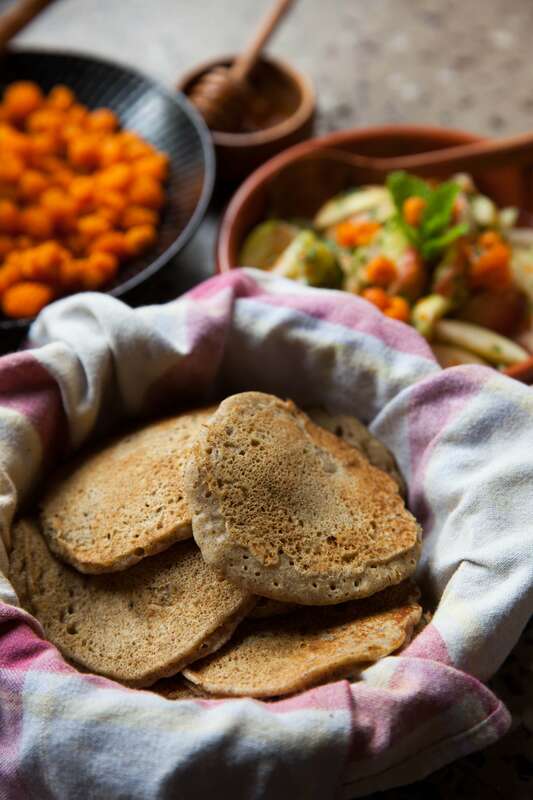 We learned to make some traditional buckwheat pancakes in a dosai pan in Bhutan. The Bhutanese believed that if you see a ‘mark’ in the pancakes when they are being cooked, it’s an auspicious sign to signify influx of guests! One of the traditional Bhutanese ways of eating the slightly bitter pancakes was to make small slits to allow dollops of butter to melt right into the heart of the pancakes, then sprinkle salt to finish. This recipe is my fancier, fluffier version, one that our Bhutanese hosts loved when we made them for breakfast one day! Here’s our pancake stack, affectionately nicknamed ‘stupa’ (a Sanskrit word meaning “to heap” or “to pile” and refers to the mound-like shape of the earliest stupas, structures that represent the fully enlightened mind of the Buddha)! Have them in a pretty stack like ours, or top them with anything you fancy! 1. For homemade buttermilk: Combine the lemon juice with the milk and set aside for a few minutes. The milk will curdle and become acidic. (If you have buttermilk on hand, please ignore this step and use 200 ml of buttermilk). 2. Combine the dry ingredients – flour, sugar and salt in a large bowl. Add the egg, mashed banana, orange juice, orange zest, butter and buttermilk into the flour mixture and stir until well combined and all lumps are smoothened out . Let batter rest for 10 mins for fluffier pancakes. 3. Heat up a frying pan and add a little oil or butter. 4. Spoon 1-2 tbsp of batter for each pancake. Don’t overcrowd the pan. I can usually do about 4 pancakes as these are just small pancakes. Add more batter if you prefer bigger pancakes. 5. Cook until bubbles appear on the surface and the underside is turning brown. Flip over carefully loosening the edges first before flipping. 6. Top with fresh fruits, chia seeds, honey, maple syrup, yoghurt, ricotta cheese, Nutella, choc chips or mascarpone cheese or fresh cream, depending on what you fancy! They make a pretty stack too! Keep your pancakes in a bowl lined with a tea towel to keep them warm!